Jay Liebowitz is an internationally recognized scholar, researcher, writer and educator and currently holds the Orkand Endowed Chair in Management and Technology, University of Maryland University College. Dr Liebowitz was ranked one of the top 10 knowledge management researchers/practitioners out of 11,000 worldwide, and according to the January 2010 Journal of Knowledge Management, he was ranked #2 worldwide in KM Strategy. Dr. Liebowitz is the Founder and Editor-in-Chief of Expert Systems With Applications: An International Journal (published by Elsevier), which according to Thomson 2008 Impact Factors was ranked #1 worldwide in the OR/MS category. Prior to holding the Orkand Chair, Dr. Liebowitz served as Professor at Johns Hopkins University, Robert W. Deutsch Distinguished Professor of Information Systems at the University of Maryland Baltimore County, and Professor of Management Science at George Washington University. Other appointments have included Knowledge Management Officer at the NASA Goddard Space Flight Center and Chaired Professor of Artificial Intelligence at the U.S. Army War College. Dr. Liebowitz has published over 40 books and hundreds of technical and academic articles. He is a Fulbright Scholar, IEEE-USA Federal Communications Commission Executive Fellow and recipient of many awards, including the 1996 IACIS Computer Educator of the Year Award. 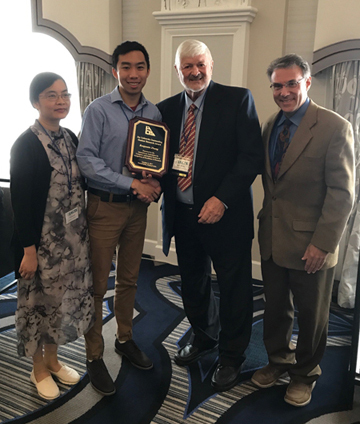 We congratulate the winner of the 2017 Jay Liebowitz Outstanding Student Research Award, Benjamin Zhang, pictured receiving the award above with Wenying Sun (his faculty mentor & co-author, on the left), Robert Behling (IACIS Executive Director, in the center), and Jay Liebowitz (on the right). 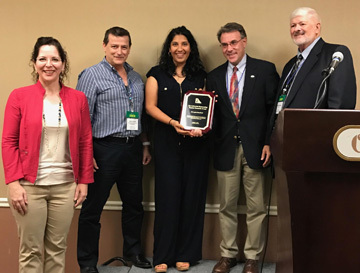 The Jay Liebowitz Outstanding Student Research Award is an annual award recognizing the outstanding student research paper submitted to the IACIS Annual Conference. While the paper may include co-authorship with other students and/or faculty, the research reported must be based on a student-initiated project. Criteria evaluated will include: 1) contribution of the research to the existing literature; 2) research methodology, data collection and analysis; 3) lessons learned; and 4) clarity of writing and presentation. Selection of the outstanding paper will be made by a committee consisting of the President, Executive Director and Immediate Past President of IACIS. The award includes a modest honorarium and recognition in the conference program. 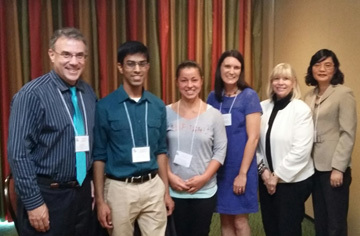 Presentation is made at the annual IACIS International Conference. Research paper: "IMPACT OF USERS' MOTIVATION ON GAMIFIED CROWDSOURCING SYSTEMS: A CASE OF STACKOVERFLOW"
Research paper: "PERCEPTION OF DIGITAL SURVEILLANCE: A COMPARATIVE STUDY OF HIGH SCHOOL STUDENTS IN THE U.S. AND CHINA"
Research paper: "WHAT MAKES THEM CLICK: GENDER, SOCIAL MEDIA AND THE COLLEGE"
Research Paper: "THE IMPORTANCE AND IMPACT OF DETERMINANTS INFLUENCING BUSINESS INTELLIGENCE SYSTEMS EMBEDDEDNESS"
Research Paper: "WOMEN AND MINORITIES IN COMPUTER SCIENCE MAJORS: RESULTS ON BARRIERS FROM INTERVIEWS AND A SURVEY"
Reseach paper: "IS THE GROWING USE OF ELECTRONIC DEVICES BENEFICIAL TO ACADEMIC PERFORMANCE? RESULTS FROM ARCHIVAL DATA AND A SURVEY"
Research paper: "THE SOCIAL SCIENCE OF DATA WAREHOUSING: ITS EVER-EVOLVING CORPORATE CULTURE"